Lee Stoerzinger has been helping our clients accumulate, preserve, and pass on wealth since 1993. Our professional experience, independent approach, and dedication to client relationships presents a unique opportunity for those looking to build meaningful financial success. Our expertise is in helping clients identify and understand how the pieces of their financial lives fit together. In working with our firm, clients take part in a clear planning process which includes defining objectives and expectations, monitoring for changes, and most importantly, measuring results in a way which apply directly to their life. Our staff consists of experienced professionals with a client-focused approach. Not only will you find our team members knowledgeable, but you will also discover that our staff truly cares about helping make your dreams a reality. We want to have long-term relationships with our clients. As with most things in life, going into a situation with knowledge and confidence tends to make the outcome much more positive. Many years of providing financial solutions, in-depth understanding of varying markets and economic cycles, and staying educated in a changing industry contribute to the value Lee brings to each situation. Our focus is converting experience into wisdom for the clients we serve. 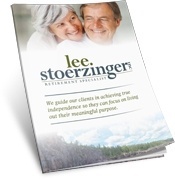 Lee Stoerzinger has been independent since the day he started, in both resources and recommendations made. We represent our clients to the marketplace and believe objective advice is a primary assumption. Money is one of the most personal things in our lives. It influences our families, work, and the choices we make. When people seek a relationship with us, it is trust that is at stake. It is also the foundation of our business.